(Nanowerk News) Scientists at Tokyo Institute of Technology have theoretically demonstrated that special tetrahedron nanostructures composed of certain metals have a higher degree of symmetry than the geometrical symmetry of spherical atoms ("Nanomaterials design for super-degenerate electronic state beyond the limit of geometrical symmetry"). Nanomaterials with unique and unprecedented electrical and magnetic properties arising from this symmetry will be developed and used for next-generation electronic devices. Studying symmetry, one of the most fundamental concepts in physics and chemistry, can facilitate a deeper understanding of the laws shaping our universe. Spherical atoms have the highest geometrical symmetry, and thus exhibit the high multiplicity of quantum states, usually called degeneracy. It has long been believed that any polyatomic species cannot exceed a sphere due to geometrical limitations. However, an inflated tetrahedron exhibits the anomalous degeneracy surpassing spherical atoms. Atoms naturally have the highest degree of geometrical symmetry, corresponding to the spherical symmetry. An interesting property often arising from symmetry is a high degree of degeneracy--a characteristic of quantum energy levels wherein a given energy level can correspond simultaneously to two or more different states in a quantum system. Degeneracy gives rise to properties including high conductivity and magnetism, which could be exploited to create novel electronic materials. Unfortunately, given the limitations of geometrical symmetry, no substance is known to have a higher degree of degeneracy than spherical atoms. But what if substances could have a different type of symmetry leading to a higher degree of degeneracy? How could such a symmetry be explained? Researchers from Tokyo Institute of Technology, including Prof. Kimihisa Yamamoto, set out to demonstrate the existence of metals with such types of symmetry. The team inferred that special inflated tetrahedron structures made of specific metal atoms, such as zinc and magnesium, may have a special type of symmetry arising not from geometrical properties but from the dynamic characteristics of the system. "We have demonstrated that realistic magnesium, zinc, and cadmium clusters having a specific tetrahedral framework possess anomalous higher-fold degeneracies than spherical symmetry," explains Yamamoto. The team used a tight-binding model analysis, validated with density functional theory calculations, to identify the general condition regarding the bonding interactions between atoms (the "transfer integrals") giving rise to the predicted dynamical symmetry. "Surprisingly, the degeneracy condition can be represented as an elegant square-root mathematical sequence involving the ratios of the transfer integrals. It is also impressive that this sequence has already been discovered by Theodorus in the ancient Greece, independently of materials science," says Yamamoto. 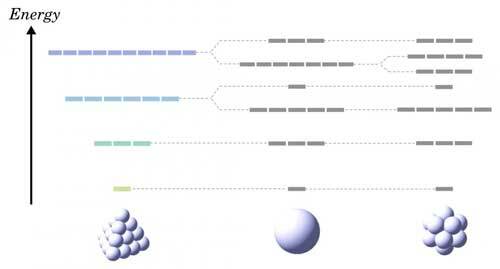 This research demonstrated that nanomaterials with a degree of symmetry higher than that of spherical atoms can be realized. The super-degenerate quantum states resulting from this dynamical symmetry could be exploited in multiple ways, such as designing new materials with unprecedented conductivity or magnetic properties, heralding the next generation of electronic devices.